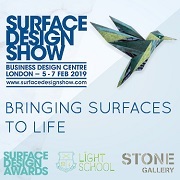 Covering over 100 design events a year and currently housing over 31,300 images in 1,165 reports keep 144 countries and 5,450 cities in the know! Are you reading Trendease.com? In this edition of Trendease we bring you in-depth coverage of trends presented at the winter trade events: Heimtextil, Maison&Objet, Domotex, imm cologne, Passagen, and more. See innovation in the textile, furniture, lighting, decorative accessory, and interior fashion disciplines. Discover how fabrics and materials are being developed for a brighter future, see new talent push the envelope, and find inspiration in new colors stories for the upcoming seasons. Texture, color, motifs, and beyond! Get inspired with the February edition! Frankfurt — Welcome to another inspirational issue of Trendease! As you know, January was the month brimming with winter trade shows. Fulfilling our duty to you to bring you a recap of what you may have missed (or flew by on your way to meetings with vendors and colleagues), the February 2009 edition delivers to you the trend themes presented at trade shows and other peripheral happenings. Read about emerging trends and see over 15 fashionable interiors in this gallery. Paris — Humor, contradictions, and vivid colors collide in this gallery featuring the Iconoclash room from the latest edition of Maison&Objet. See containers that look like tin which are actually ceramic, traditional imagery with modern applications, ethnic creations with broad appeal, and the old with new mingling together in winning combinations. Paris — Take a journey back in time to take refuge in the objects of yesterday. In this trend selection one will find that a period of disorientation is a reality check for Beauty. But these objects are just as valid today with new clever touches in design and nostalgia. Valeurs-refuge in a few words: Sophisticated, Masculine, Dilapidated classic, Eccentric, Anglo-French, Artistic, Craft. Paris — While some people relish in neutrals and safe hues, others are soaking up color. Bright, bold, and color blocked textiles, furniture, lighting, accessories, and art are enlivening homes around the globe. Don’t be shy, be bold and take hold of what the spectrum has to offer! Cologne — With Extra Much it is anything but minimal. The Trendboard at imm cologne has worked together to create the annual Interior Trends stories catering to professionals in design. Each trend presented is supported by images and themes including color, shape, and material. This year the directions are Extra Much, Near and Far, Tepee Culture, and Re-Run Time. Cologne — With the Near and Far trend designers are accomplices of nature. The Trendboard at imm cologne has worked together to create the annual Interior Trends stories catering to professionals in design. Each trend presented is supported by images and themes including color, shape, and material. This year the directions are Extra Much, Near and Far, Tepee Culture, and Re-Run Time. Cologne — With the Tepee Culture we have broken free of the urban jungle. The Trendboard at imm cologne has worked together to create the annual Interior Trends stories catering to professionals in design. Each trend presented is supported by images and themes including color, shape, and material. This year the directions are Extra Much, Near and Far, Tepee Culture, and Re-Run Time. Cologne — With the Re-Run In trend we save the planet in style. The Trendboard at imm cologne has worked together to create the annual Interior Trends stories catering to professionals in design. Each trend presented is supported by images and themes including color, shape, and material. This year the directions are Extra Much, Near and Far, Tepee Culture, and Re-Run Time. Hanover — Design shows that creative flooring solutions are the foundation of a well-coordinated interior design concept. This gallery is focused on decorative and glamorous carpets seen at last month’s Domotex. As early as ancient Roman times, impressive floors showed people’s desire to incorporate the floor as a creative surface; designs have changed, but the concept remains the same. Hanover — Color is all about using color with zest and imagination. Colors are combined to create innovative and futuristic designs. Color is the expression of an individual style, and adds a personal note to any interior design scheme. Color comes alive in the world of soft floor coverings. Come on an adventure to that world within this gallery. Hanover — For the theme of Structure, “less is more,” and the focus is on the natural, tactile quality of textured carpets, which bring warmth and feeling to any room with their subdued colors and their restful patterns. The carpets found within this gallery are characterized by lively structures, natural textures and a soft feel. Amsterdam — The Trendease Team is impressed with Celia's ambitions to bring nature into our homes nature, to design responsibly, and her work with a women’s collective in Nepal. Not only does Celia envision the designs, she works with the producers through the entire manufacturing process. Oftentimes Celia shares stories about teaching the handcrafters new techniques with the skills they already hold; therefore, utilizing traditional craftsmanship for a modern design aesthetic. Cologne — Wait till we show you what we found across the river from imm cologne! Clever furniture, a range of lamps, textiles, accessories and housewares that will make you sit up and take notes. We were very glad we made the time to visit this fledgling exhibit. If the following editions are half as good as this one, they will be a success. And of course we wish both the young designers and the exhibition luck in the future. If they continue designing like this, they will need little of it. Frankfurt — “Saving the Planet is Not a Bad Idea!” And we at Trendease could not agree more. 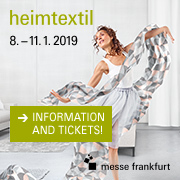 Heimtextil in Frankfurt showed us what cutting-edge companies are doing to reduce waste, develop cleaner products and cleaner production processes. In this month's EcoChic feature discover cradle-to-cradle solutions for a greener world. Frankfurt — This week’s gallery of four interiors will inspire our subscribers with rooms that support the ethnofolk, purple, and black and white trends. Also read about tidbits on carpets and saving the world. Be entertained by Jennifer’s new crazy adventure in the land down under and receive a special virtual hug from the woman always on the go and always full of energizing inspiration. Worldwide — Being avid drinkers of wine we come into contact with quite a few corks. As much as we would love to get in a debate about cork closures vs. synthetics and (gasp!) twist-offs, this newsletter is not about wine, but rather about design. Which brings us to the point; during the winter trade shows we have noticed many interior products made from cork. You are welcome to partake in a gallery full of designer cork floors, wallpaper and décor! Cervia — This week’s newsletter gallery looks at a new spin on a popular trend: damask. See how this trend has moved onto a design s-curve, the popular and successful motif is redesigned ever so slightly to deliver a new, yet similar, aesthetic vision. Subscribers are welcome to see the clever innovation in product form within and read about the new products workshop.